Party Monster is a clever little app for iOS that allows you to quickly queue up songs into a temporary playlist. The app is a perfect utility for when you have friends over or you have a party happening at your house and you want to Airplay some songs to keep the mood going. 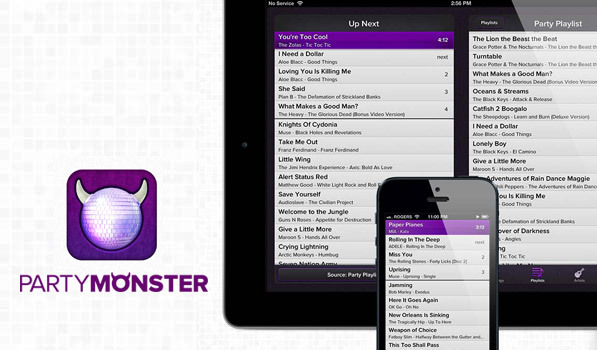 Party Monster uses your local music library on the iPhone or iPad to let you pick songs for the playlist. On the iPhone, a “+” button at the bottom left brings up your library of songs, playlists, artists and albums. To add songs to the playlist, simply tap and select all the songs you want and hit ‘Done’. On the iPad, you get a split screen view, which is much easier to handle. Party Monster creates a playlist on the fly with ease. To play a song, simply swipe left to right. To remove a song, swipe the other way. You can tap and hold down on any song to change the order of the songs in the list. It’s very spiffy and works great. The app also crossfades when you play/pause or change tracks. The UI that Party Monster sports is simply excellent. There are lovely little animations all over the app and some great attention to detail. Once you’ve added your pick of songs to the playlist, there’s a subtle purple gradient that moves left to right on the top most song to indicate that you have to swipe in that direction to start playing the track. The track that is being currently played is displayed in purple and sticks to the top as you scroll through the list. There’s also a lovely animation for when you play tracks that have already finished playing once. Party Monster is an app that you probably won’t need every day, but is still a solid utility to have stuffed in an iOS folder for when you need it. It has a great UI, lovely animations and is overall a fantastic experience. There’s a very clever option in the app’s settings, enabled by default that refuses playback of Nickelback songs. The app is available on the App Store for $1.99. I also love the velvet-coated icon of the app.